Exciting things are happening in Birmingham. Even more exciting than normal I mean. Although probably only exciting if you’re interested in rare diseases, undiagnosed conditions and pioneering new developments. But if you’re here reading this blog, then I guess to some extent you are. In our search for a diagnosis for Hugh, we have seen many, many medical professionals. These are spread out over six different hospitals across the region, each generally working independently from each other, concentrating on their own specific symptom or area of interest. At nearly 6 years old he generally only has about one appointment a month now, however in the early days it wasn’t unusual to be at 3 different hospitals on the same day. In fact, he’s been an inpatient at one hospital and travelled by ambulance to another hospital for appointments and tests – I kid you not! Some of these specialists send letters to each other, some don’t. Some access the same computers systems, some come under different NHS trusts so can’t access the results of tests carried out elsewhere. And when the appointments were coming thick and fast, there simply wasn’t time for the clinic letters to be typed and faxed between them. It was down to me to manage all of that information. I carried my note book to all appointments. I’d have my list of questions ready, I’d take notes and then bring it along to the next specialist – feeding back figures, information, results and what further tests were being carried out. I was constantly worried that I’d misinterpret a vital piece of information and pass on something incorrectly. It was a lot of pressure and a logistical nightmare. Thankfully, finally, someone has realised what a ludicrous system this is and as a result, the UK’s first holistic, paediatric rare disease centre is being built at Birmingham Children’s Hospital. This approach will be so much more patient centred and will ensure that many of the professionals involved in a child’s care can be in the same place at the same time. Imagine, not having to travel from hospital to hospital to see different specialists but having them all under one roof and simply moving from room to room. Better still – you stay in the room and they come to you. They could even talk to each other! In addition, The Roald Dahl Marvellous Children’s Charity has funded two rare disease nurses who will help co-ordinate care, address the needs of the families, sign-post to other relevant services and support and ensure access to cutting edge research. Co-ordinated care, support and information such as this will be a life-changer for families like ours. The lovely Dr Larissa Kerecuk, a Consultant Paediatric Nephrologist and the Rare Disease Lead at Birmingham Children’s Hospital has written in more detail about the plans for The Rare Disease Centre. You can find it over on Special Needs Jungle. 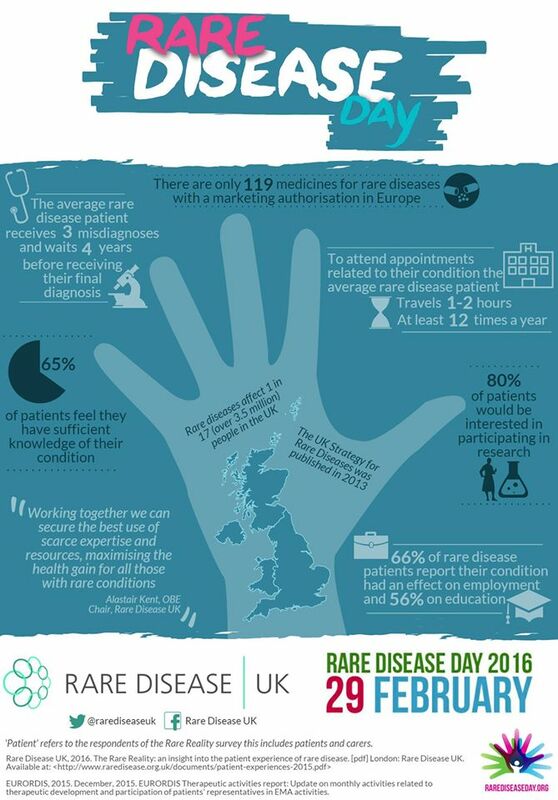 I have been lucky enough to see some of the plans for the new rare disease centre and they are really exciting. After much discussion and consultation with families, the centre has been carefully designed to accommodate a range of needs. I generally find the outpatients departments in the hospitals we attend very cramped and difficult to move around with a wheelchair, which given the needs of many of the children that attend is utterly ridiculous. Furthermore, none of them have adequate disabled changing facilities for children unable to use a toilet but too large for a standard baby changing table. Thankfully the new rare disease centre addresses both of these issues with wide open plan areas, wider doorways and adult changing facilities with a portable hoist. They’ve included a chill out room, a sensory room and a family kitchen – so you can get a cup of tea, chat with other parents or prepare your child’s meals. It really does all sound amazing. Obviously something like this costs a lot of money so The Birmingham Children’s Hospital have launched The Star Appeal – you can find out more about that here. 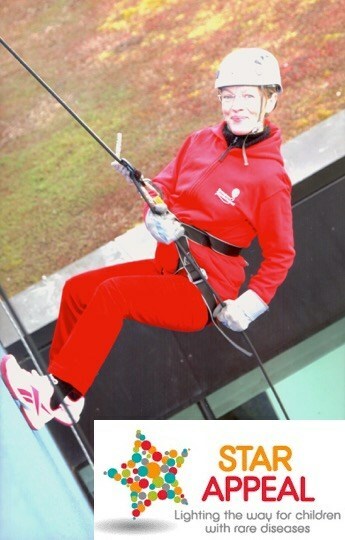 Larissa Kerecuk is also completing her own personal challenge and abseiling 150ft to raise money for the star appeal. You can find her JustGiving page here. Rare Disease Week runs from 22nd – 29th February and there’ll be various events at lunchtime in The Children’s Hospital. The highlight of the week will be on Saturday 27th February: The Marvellous Superstar Club Rare Disease Day. This will be a day of fun for the whole family, with talks for the families and entertainment for the children including magic shows, the animal man, music and face painting. 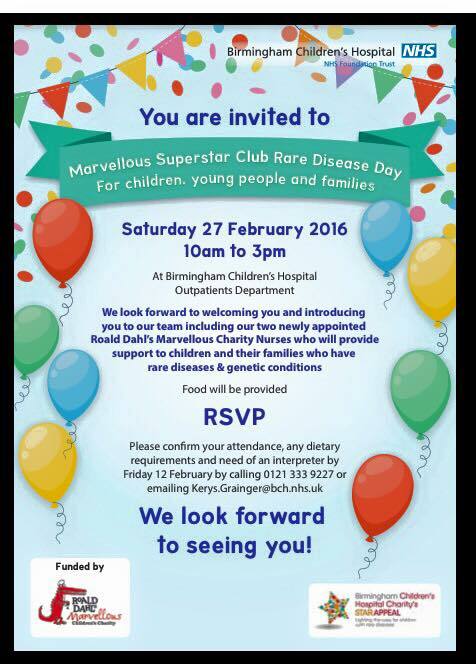 The two new rare disease nurses will be there too so this will be a fab chance to meet them. If you’d like to attend (and you really should) contact kerys.grainger@bch.nhs.uk; 0121 333 9227). I’ve been asked to do a little talk for families too, so pop along and say hi.